ItemBARK_1990.0003.0066 - Two unidentified Chinese men in front of the Sing Kee & Co. Store (former Yan War Store) in Barkerville; circa 1910. Item BARK_1990.0003.0066 - Two unidentified Chinese men in front of the Sing Kee & Co. Store (former Yan War Store) in Barkerville; circa 1910. 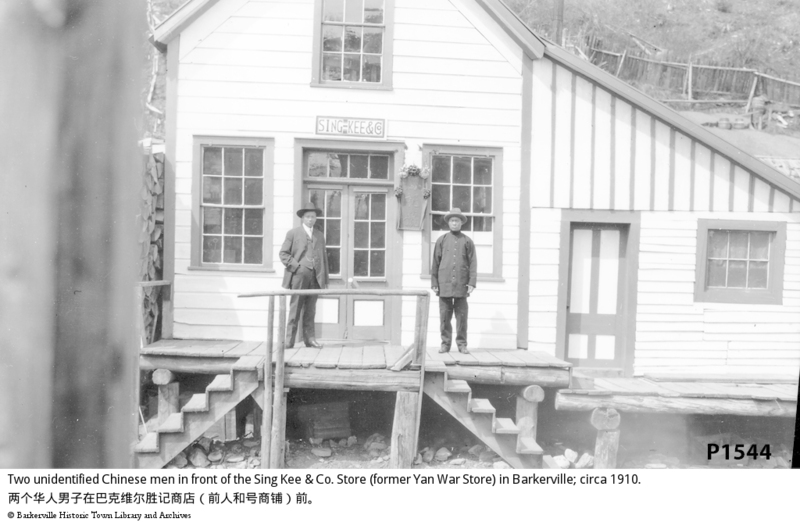 The Sing Kee Co. Store in Barkerville with two Chinese men standing on the boardwalk in front. The building now depicts the Yan War Store, building No. 4. There is a portion of the hillside at the top right. See also P 1523, P 1983. Translation of characters on sign: Sing Kee's & Co.